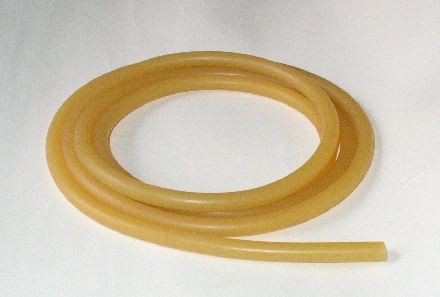 We offer rolls of latex tubing in two different lengths: 10 feet and 25 feet. Our 10 foot rolls are available in every size we offer, while the 25 foot rolls are available in most sizes. Unless otherwise stated 10 foot rolls will be one continuous piece. Rolls that are listed as 10 feet (up to 2 pcs) will contain up to two pieces of random lengths totalling 10 feet. If the outside diameter is 1/2 inch or less, the 25 foot roll would contain one continuous piece. Please note: the 25 foot roll for tube sizes greater than 1/2 inch outside diameter will contain up to three pieces of random lengths totalling 25 feet. They will be listed as 25 feet (up to 3 pcs). Each roll is priced at a discount to our �by the foot� pricing. If the size of the latex tubing you order has an outside diameter of � inch or less, our policy is to ship one continuous piece up to 25 feet. If we cannot ship the size you selected in one piece, we will send you an additional two feet for each additional piece included in your shipment. If the size of the latex tubing you order has an outside diameter greater than � inch, our policy is to ship one continuous piece up to 10 feet. If we cannot ship the size you selected in one piece, we will send you an additional one foot for each additional piece included in your shipment. If we cannot provide you with continuous feet we will inform you via email with the sizes of each piece you will receive. Any questions, please contact us. PLEASE NOTE: Our continuous Piece Policy does not apply to any item that we specify as containing "up to 2 pieces" or "up to 3 pieces" or any item marked as BULK.